This looks very interesting. Fiber for the desktop to other devices. Not specifically for networking (although that is an option, too, from the look of things). Can you imagine sitting down at your home PC, connecting your MP3 player to the Light Peak connection and downloading 20GB of your music in 15 seconds? But if this replaces USB, how am I going to charge my phone? 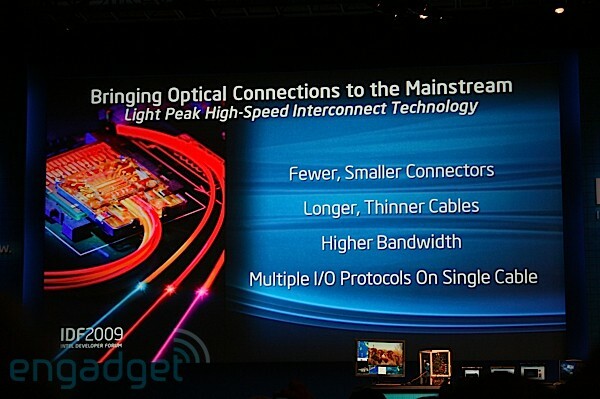 Intel unveils Light Peak 10Gbps optical interconnect for mobile devices: "
Intel unveils Light Peak 10Gbps optical interconnect for mobile devices originally appeared on Engadget on Wed, 23 Sep 2009 13:01:00 EST. Please see our terms for use of feeds. Permalink | Email this | Comments"
Talk about your breakthroughs in medical technology! This is just amazing. Yeah, it looks kinda creepy, but for the ability to see after being blind, I think it would be worth it. Make sure you follow the link and watch the video from the Miami Herald. It's amazing. 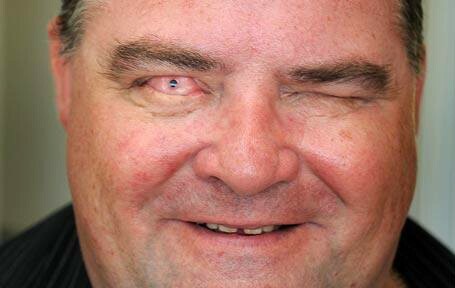 Video: doctors implant tooth into eye, restore sight, creep everyone out: "
Osteo-odonto-keratoprosthesis. It's a real procedure that really does revive people's ability to see, yet we get the feeling that people will be more, um, excited about how it's done than why it's done. The seemingly Mary Shelley-inspired doctors extract a tooth from a blind person and drill a hole through it, where a prosthetic lens is placed, and the resulting macabre construction is implanted into the blind person's eye. The tooth is necessary as the body would reject an artificial base. It's not at all pretty, and it cannot repair every type of blindness, but it's still a major step forward. To hear from Sharron Thornton, the first American to have undergone the procedure, check the video after the break, but only if you can handle mildly graphic content -- you've been warned. Video: doctors implant tooth into eye, restore sight, creep everyone out originally appeared on Engadget on Tue, 22 Sep 2009 06:25:00 EST. Please see our terms for use of feeds. Read | Permalink | Email this | Comments"
8 years ago. . .
Well, today is September 11th, 2009. It’s been 8 years since our country was brutally attacked by terrorists. I could go off on a political tangent, but I won’t. I want to share my experiences with you. Early in the morning of September 11th 2001, my wife Marie and I got up, put our suitcases into the car and headed off for a weeklong trip to the Boston area, followed by a week of vacation. We had fun plans. If memory serves, we left the house between 5:30 and 6:00 AM. We had to get an early start to get to the hotel in time to check in so I could be rested for the next day. The day before, I had talked with my coworkers who were going to the same conference. We were all looking forward to it. The drive up Interstate 95 to the New Jersey Turnpike was quiet and uneventful. I had been surfing the radio trying to find a Christian station. It’s always hard on a long trip, especially if you don’t bring your own music. Then I heard a news flash. Someone had flown a small plane into one of the buildings of the World Trade Center. (A few years later, I would find out that a friend of mine would be awakened by a phone call from the Air Force base he worked at, being told that someone had flown a plane into the World Trade Center. His comment was simple, not completely understanding the gravity of the entire situation: “Moron. I could miss that!”). At first, I thought it was one of those radio pranks, but the reports kept coming. As the reports continued, the description of the plane got bigger. As we got closer to New York City, the description got even more grim. During the 9:00 AM news cast on whatever radio station we were listening to, they broke in when another plane crash, this time in the south tower, then, the Pentagon. That’s when I knew this was a big deal, and I was expecting more. As we got closer to NYC, we could see the smoke rising up from the WTC. It was as if Manhattan Island was a steamboat, trying to go out to sea. The sight was ominous. We had heard all the bridges were closed going in to NYC, so we stopped at a rest stop to get a map. We decided that I-287 was our best choice, and started planning our route to get up to Boston. I-287 to I-87 to I-84. I tried to call my boss in DC, but couldn’t even get a line out. We started back out on the highway. Trucks were parked on the breakdown lane everywhere. As we were driving, my wife looked and said “One of the towers just fell!” That was the next thing reported on the radio. I was far from calm. If I remember right, we stopped again so we could switch drivers. I navigate better than my wife does. I was following the map, and nervously checking anything that looked suspicious; cars, trucks, anything that could possibly cause problems. I was thinking of all the other things that could be going on. Was there some sort of chemical agent in the plane that was activated by heat that was being dispersed? Biological agents? Were other cities around the world being attacked, too? I kept trying to call my boss. By the time we got to the Hudson River, I finally got in touch with him. He said the conference was obviously canceled since I was the only one who was going to make it to Boston. He also said to just go and take that week of leave and come back next week. Nothing was going to happen anyway, with all the confusion. So we continued up to Boston. I friend and coworker told me about the ride home that day from Arlington, VA. She would often “slug” in to work. Slugging is organized hitch-hiking so that drivers can use the car-pool lanes. She had slugged in to work that day. When word finally came down for people to go home (I think it was around noon), people were talking together, comparing notes, trying to get all the slugs home. She ended up in a 4 passenger car with 5 other people (that makes six if you’re counting), riding dangerously close to the stick shift. But she was thankful for the ride. When we got to the hotel, it was very quiet. CNN was on in the lobby, showing the replays of the WTC collapsing, the Pentagon burning, and the smoking hole in Pennsylvania. I think we canceled our reservation, and then we went to look up some old friends from college. When we got there, Diane opened the front door and ran to hug us, yelling “God sent us the Air Force!” I was a little bit embarrassed. We went to a prayer meeting with Steve and Diane that night. The mood was very somber and somewhat fearful. It felt like everyone there was expecting me to have some sort of answer as to what would happen next, because I was in the military. I was just as clueless as everyone else. Flash back to a few months prior, say about May or June. I was sitting in my office and got a call from some woman in Texas whose relative had just moved to the Arlington VA area. It was a wrong number. My number had two numbers reversed from her relative’s number. She called me three or four times before she got it right finally. When I got back to my desk after my leave after 9/11, there was a voice message on my phone. It was that woman, calling to see if I was OK. For the next few months, that was the general feeling that I got across the US. People were genuinely concerned with others and were there to help out. I think we’ve lost a lot of that in the past eight years. Yes, a lot has happened since then. The Pentagon has been rebuilt (but the WTC has not). We’ve invaded Afghanistan and Iraq. We’ve ensured the people could put democratic governments in place. There have been two elections in Afghanistan and one in Iraq. But the support of the American people has drifted off. It’s been eight years. My life has changed many times over. Yours probably has too. I ask that you do one thing. Don’t forget what happened on that terrible day. Don’t trivialize it by calling it a “Manmade disaster”. Don’t talk to me about your conspiracy theories about demolition charges and cruise missiles. I had friends at the Pentagon who SAW the plane fly over their heads on Route 110, seconds before crashing into it. That was no cruise missile. Don’t speak poorly about this country that I gave 21 years of my life for. Just keep it to yourself. Remember what really happened. Don’t let anyone forget. OK, this is just really cool. And, may I add, it's about time. I know this has been worked on before (since the '30s) so why just now getting to work? Prototype airless vehicle tires: "
As we have reported before, the idea of an airless tire (or 'tweel') is at least as old as the 1930s. Still, these photos of prototype non-pneumatic tires under development for the US military by Resilient Technologies, LLC, are pretty sick. Gimme! This looks kinda interesting, but, really, who sits like that? She isn't even touching the keyboard! Come on, let's see some realistic action shots! But seriously, the term "laptop" is such a bad term because they get so hot you NEVER want to put it on your lap! If this keeps your lap from being scorched, and the speakers sound better than the ones in my "laptop", then maybe it's a good idea! Philips Cushionspeaker Laptop Stand: "
OK, this looks VERY cool. Roads that can generate power to feed the grid near by? Awesome stuff, and uses all that wasted space for something good. And maybe the roads would stay clear! 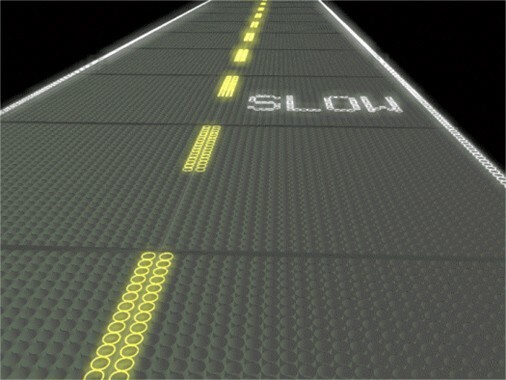 Solar Roads get small DoE contract, confidence to change the world: "
Solar roadways? Yeah, we've seen 'em before, but we've yet to see America's own Department of Energy give any one development company such a notable vouch of confidence. Just recently, the DoE handed over a $100,000 contract to Solar Roadways, which is just enough to build a prototype of the 'first ever Solar Road panel.' The 12- x 12-foot panels could theoretically be embedded into roads, and when shined upon, could pipe good, clean electricity straight into the grid. Heck, they could even boast LEDs in order to alert drivers to upcoming accidents or changes in road conditions. Reportedly, each panel would cost around $7,000 (at least initially), and if these were used on the entire US Interstate system, we could pretty much forget about using non-renewable energy sources to power our homes and businesses. Of course, our government is simultaneously wasting money on repaving perfectly good roadways with antiquated asphalt, so there's a tremendously great chance that this won't amount to anything. Solar Roads get small DoE contract, confidence to change the world originally appeared on Engadget on Sun, 06 Sep 2009 18:06:00 EST. Please see our terms for use of feeds. The Procrastinators Anonymous meeting has been rescheduled to next Thursday. Again. Do you have a lot of projects that you've started but just can't seem to finish? I do. I don't know if it's really procrastination or if it's just that I don't have the energy to get back to them even though I'm excited about them. I'm betting it's the first one, though, although I don't have much energy lately. Let's take a look at a few of the projects I currently have going. chronicled here on this blog. This project may have actually come to a temporary close. I finally gave up on installing Windows Vista Ultimate x64. Every time I got it "working" it would freeze for no apparent reason. There wouldn't be an error message in the logs or anything. It would just stop processing information. Not even the courtesy of a blue screen of death! My solution? Install Windows 7 x86. For some reason, the 32-bit drivers all work flawlessly on this motherboard, but the 64-bit drivers do not. I have no faith that ASUS will do anything in working toward the 64-bit drivers for this motherboard. In fact, when I bought this motherboard from Tiger Direct, it was a close-out, so I'm sure ASUS doesn't even support this motherboard anymore. However, Windows 7 x86 works great. Multi-media entertainment center PC. I haven't told you about this project, because it hasn't really moved much at all. Back when my son and his girlfriend were starting to play Warhammer Online, my son's girlfriend couldn't get Warhammer to play well on her PC. They ended up buying a new system with a faster processor and a better video card. But here's the deal; her old PC was a Windows XP Media Center PC. In fact, it is an HP Pavilion a1473w. The DVD drive was not working, so I had to replace that, but other than that, it's a working system that is just sitting on the floor in my office. I also have the wireless keyboard and mouse from my Gateway GM5664 (I use a Merc gaming keyboard and a Logitech Mx518 mouse). I also have a Toshiba external Multi-media audio/usb hub that has a remote control for it. So my plan is to put them together with a wireless network card that I may have laying around and hook it to my LCD TV in the bedroom. That's my next project, I think. It should be fun. Home server. This will be a fun one. I had a meeting last month with a Microsoft technical person who lives in the Atlanta area. He got me excited about an interesting idea, but I need to build a system from the ground up to support it. He said he has a server in his house running Windows Server 2008. It's a dual processor, quad core system (so that's a total of 8 cores) with about 8GB of RAM and over 2TB of disk space. He runs several other virtual servers in the built-in virtualization of Windows Server 2008, with Windows Home Server being one of them. Like me, he uses Windows Home Server to back up all the computers on his home network. Unlike me, he has actually tested his backups. He bought a new laptop hard drive for one of his laptops, the same size as the existing drive. He then swapped the drives, booted with the recovery CD that Windows Home Server provides, and made an exact duplicate of his laptop drive on a new drive! It worked flawlessly. Well, I have a spare server case, I just need an awesome motherboard to put into that case, then shuffle around some of my drives and PRESTO, new server. Then I need to get my hands on a LEGAL copy of Windows Server 2008 (I have a plan for that, and it doesn't include spending gobs of money for Server 2008). So that's on the back burner until I can get the guts and the brains to put in this new Franken-puter body. I have two projects that involve Linux. First, my grandson, affectionately called the grandmonster, has developed quite a love for computers. So much so that he will sometimes not allow his mother to use her laptop. "MINE!" So, I have an old Toshiba laptop that is currently running Windows 7 (and quite well, I might add, considering it only has 256 or 512MB of RAM). I plan to install Linux on that laptop, and ensure all the devices are working correctly, then donate it to the grandmonster cause. The second Linux project involves building a dual-headed coding monster. I need to get back into application development, just so that my skills don't get rustier than they are now. Hopefully I can exercise my programming muscles after building a Linux monstrosity with a dual video card. I'm sure I can scrounge the parts from around the house somewhere. Another project I want to try but haven't had or made the time for, and is kinda cool, involves my new car. One of the cool features of the stereo in my car is that it has a USB port. There's two things you can connect to this USB port; an iPod, or a thumb drive. I don't have an iPod, and the one I want is too expensive for me to justify for an experiment, so I'm going to go with the thumb drive. An 8GB thumb drive will hold most of my music collection. Of course, a 16GB thumb drive would hold all of my music collection, but is more than the price I want to spend for this experiment. So, I plan to go to Microcenter and buy an 8GB thumb drive (I'll be in that area on Wednesday for a doctor appointment, so why not, right?). Supposedly my car stereo will recognize the file structure on the thumb drive and let me navigate and play playlists off the thumb drive. Another aspect of this project is using the AUX port on the car stereo. My Blackberry Curve has a headphone port, but it uses a 4 conductor system, rather than the normal 3 conductor system your headphones uses. So what's the 4th conductor for? Well it's for the headset/microphone system that comes in the box with the Curve. Here's what I want to try. Since we have two Curves, and my wife doesn't use her headphones for anything, I want to buy a 3 conductor 1/8 inch stereo plug, strip off the ear pieces of the headphones, figure out which is ground and which is the lead, then solder them to the new plug. The AUX jack in my car is designed for the three conductor plug (normal headphone 1/8 inch). If it works correctly, I can then place calls from my Curve using the built in microphone on the headset, but hearing the call on my car stereo speakers! My main concern with this is feedback, but I'm sure I can figure out something. Well, those are the major projects I have in the queue for at home. Work projects are something completely different, but I won't talk about them. I grew up with LEGO, but this is going just a bit too far. Although, I have to say this is REALLY awesome! Entire house made from LEGO bricks: "
UK toy fanatic James May is having a real house built from millions of LEGO bricks. While running new wires through the walls and plumbing fixes should be a snap, I'd hate to be anywhere near the place in case of fire. GeekSugar has a gallery of pictures of the place as it's being built.